A talk and live event was held in Seibu Shinjuku Station's PePe Plaza for the movie JK☆ROCK, which is about to be released on Saturday, April 6. JK☆ROCK is a noteworthy movie with a youthful story filled with powerful band performances by a fresh cast. 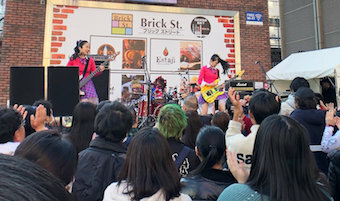 On the day of the event, there was a talk event with Masahiko Nishimura, who plays the role or a rock cafe owner in the movie, and his companion Wakadanna from Shonan no Kaze, and a live event by the three-member girls band DROP DOLL who performed the theme song. Video was also shown on the Yunika Vision screens as a collaborative event during the events. From 15:00, first the music video for "Teru's Rock" from the movie trailer and soundtrack was shown on the Yunika Vision screens. When it was finished, Masahiko Nishimura and Wakadanna appeared. The two of them talked about episodes related to rock, and when it was mentioned that "Teru's Rock" that Nishimura himself had sung was shown on the Vision screens, he showed appreciation, saying "DROP DOLL dancing behind me really helped a lot". This was followed by Wakadanna also speaking of DROP DOLL who would later appear, saying "I was really surprised by who great DROP DOLL's performances and singing are", and then they both left the stage. This was followed by a mini live by DROP DOLL that started from 15:30. The three members played the theme song "Secret Voice", Queen's "We Will Rock You", and other songs. When a member shouted "Is everyone in Shinjuku excited!? ", cheers rose from the plaza and people starting pumping their fists, bringing the venue to life. Many people walking by stopped in their tracks to look at the members performing passionately with their cute looks. There were long lines for the on-site CD sale for the theme song "Secret Voice" after the mini live, and the three members promoted the movie, saying "This wonderful movie will surely entertain you, so don't miss it! ", ending the event a great success. With the sudden breakup of the hugely popular rock band "JoKers" centered on the two "Joes", this story of youth is about how the main character Joe, who gives up on his music career, starts tutoring a beginner all-girl high school band and gets inspired to play music again through their joy of music. An original work by Shunji Muguruma, it depicts young men and high school girls who are passionate about music.